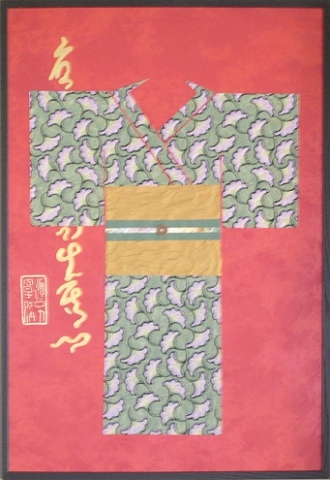 I found this exquisite hand made paper with purple ginkgo shaped leaves on it and just had to make something out of it. The ginkgo shaped leaves reminded me of Asian artwork and I remembered a time back in grade school where some students from our sister school in Japan came for a visit. They taught us how to fold origami in the form of a kimono and we made bookmarks out of them. I have since lost that bookmark but thought I could emulate it in my own way on a large scale. I now want to learn how to fold origami again!